As if I needed another reason to like this guy here comes a great piece on him in this weeks Sports Illustrated magazine. The article basically puts him in the same league as Babe Ruth as far as being able to hit homers on command, and Roberto Clemente for all the charity work he does and donations he makes. The article also points out that he is deeply religious, and would never offend God by taking steroids. Albert wants us to believe in him, and knows most people don't. Albert knows that the more he produces the less people will believe that he did this with his own talent, muscle, and natural ability. The message he wants to get out is to believe in him. Sure, no problem Albert- I got your back. I would tell you all more, but then what fun would reading it yourself be? I am sure there are a bunch of readers out there that are going to say he's nuts thinking we will all believe him, that I am nuts for believing him, and I know all about how much he charges for autographs because I am sure someone is going to throw that in. Bottom line is it's guys like him who have their own foundations to help other people, donate time and money, and don't expect anything in return that people should look up to. There are plenty of other players who do the same thing with charities and helping those who are less fortunate, and those guys are all heroes to someone- regardless of how many homeruns they hit. If he ends up on that list of 200 players, I will gladly eat my words about believing in him- but I don't think it will happen. 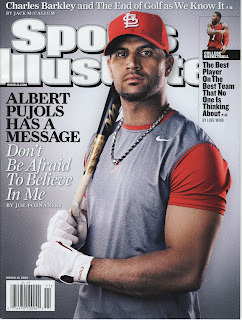 Now as for this Sports Illustrated issue, it is off to an Ultra Pro sleeve and into Pujols' binder. Well, the thing is, Mark McGwire told us that he never took steroids and that we should believe in him. Then it was Barry Bonds. And Palmeiro told Congress that he never took steroids. Then it was Roger Clemens. And now A-Rod. Sure, Pujols seems like a nice guy and all, but it seems like the more that a player insists that he never used steroids, the more likely it is that he did. But I don't really care. He's a great player with or without steroids. Agreed. However the difference in all of those guys is very obvious, all of their bodies changed significantly over the course of time, whereas Pujols has had the same body size since he came up and prior. A-Rod has never been a scrawny guy either, so I guess my point could be debated. I deluded myself into thinking that Bonds didn't do steroids for years, while cleary he did, and while there's not the clear physical evidence as there is with Bonds, I do think that Pujols' body has changed, if not as drastically. If you look at him in years past, that SI picture shows him clearly much leaner and not nearly as thick through the torso and upper arms. Could be he just lost some weight, could be roids, I don't really care either way. I believe Mario from Wax heaven said he thought he looked a little on the lighter side then what he'd seen and expected. His rookie and sophomore seasons he was pretty lean and cut, though it looked like the last few years he's been on a bit of a sloppy bulking regimen now that he's not bouncing around the OF and playing third and such. Definitely not an HGH head, and I love watching him him no matter what, seems like a nice guy, but I'm pretty skeptical with everyone these days. Bonds, Clemens and A-Rod never were the most other-centered players. Both seemed about as selfish as they came. At least Pujols seems like a nice guy, and I prefer to see the good in people, that is until they give me an excuse to see the bad. Pujols hasn't given me an excuse. I also don't like to suspect everyone who puts up great numbers. There were plenty of ballplayers who put up great numbers without the benefit of drugs. They did it then, they can do it now. Believe it or not, there are still honest players in this game/in the world. Referring to Bonds, Clemens, A-Rod, I meant "All three seemed about as selfish as they came"
Pujols has looked slimmer than "normal" going into spring training for at least the last 4 seasons now. If he's using PEDs, then I would guess that he's been doing it his entire career when you look at how he's performed. And I think it's pretty unlikely. I have a lot more to say on the subject, but I need to sleep. I hate to sound extremely biased towards a player on my favorite team, but I would be shocked beyond belief if Albert Pujols was truly found to be involved with the PED unpleasantness. I think my belief has more to do with his attitude towards the game and life itself than anything else. I'll elaborate later someday. night owl has a really great point, and I agree that the other players are/were very self-centered. But like I said, I doubt he has done any PED's but if he has, well... I guess I'll look like a fool later. I'm always amazed that writers have the guts to write these articles. In the back of their mind, they have to be thinking, "I hope I don't look like a moron in ten years." But, with no reason to doubt Albert, I'm willing to believe him. Plus, as I've blogged about before, I'm not sure I care in the first place. Marie, I have seen Pujols in person this Spring and he sure looks a LOT thinner.